Control is the UNSC codename for a location on the Forerunner Shield World of Requiem. 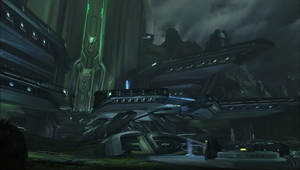 The Forerunner structure designated "Control" at night time. Control was a Forerunner structure occupied by the Covenant remnant during the Requiem campaign. The Sentinel Aggressors from the structure were defending it against the Covenant, who were attempting to gain entry to the Terminus in this structure. When John-117 first crashed landed into the shield world, Cortana led him to this location so they could access the Terminus. Six months later, Covenant stored stolen UNSC weapons and equipments in this location. After Spartan-IV Fireteam Crimson escaped from a Covenant detention center onboard a Phantom with TJ Murphy of Icebreaker squad, the Covenant in this Forerunner facility ordered their Phantom to land in the facility. Fireteam Crimson left the Phantom to engage the Covenant forces in the area, and they found out that the Covenant had placed terminals in the structure. Roland, with help from Fireteam Crimson, planted worms into the terminal and used them as a source of Covenant intel. However, after planting the third worm, the entire system shut down, and Covenant reinforcements entered the area to eliminate Crimson. After defending themselves, Crimson destroyed two Covenant radar nodes to re-activate the system, allowing the Covenant intel to continue its loading into UNSC Infinity's systems. Crimson cleared a landing zone, and Murphy returned with his Phantom to extract them. The information gathered here would later lead Crimson to a Covenant intelligence site. Later, Dr. Henry Glassman directed Fireteam Crimson back to the location to test out Spartan Anthony Madsen's looted Requiem map. Crimson was led around the area, activating Forerunner technology such as a Z-510 Focus turret anti-infantry defense network, Promethean weapon caches, and four Forerunner Z-8250 heavy artillery anti-aircaft cannons. After successfully securing the location from Covenant forces, Infinity Spartan Commander Sarah Palmer pulled Crimson back to Infinity, commenting that she will give the Fireteam 'ribbons for their science fair project'. Alternate view of the location known as "Control". Another view of the "Control" location. A ramp inside the structure.